Piling Winch Machine is famous for its unique design, good service & robust construction, cone clutch for free operation. Carbon steel shaft, heat treated pinion for smooth functioning. Fabricated steel structure. Heavy duty Bearings, Power electric motor/ Diesel Engine. Safety retched arrangement. 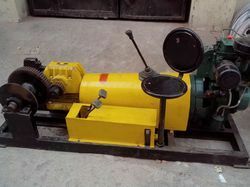 In order to meet excellent quality standards, we are supplying Diesel Pulling Winch. Our reputed entity is engaged in supplying Diesel Pulling Winch. With the help of our professionals, we are capable in offering high quality Cable Pulling Winch Machine. Offered array of machine is engineered using high quality components and machinery under the guidance of our skilled engineers. We offer them at very reasonable price to our customers. 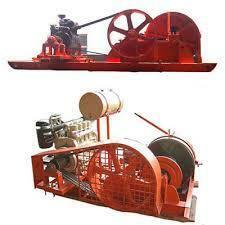 Clients can avail from us a wide and remarkable range Diesel Pulling Winch. Available with us is a range of winches that are designed and developed specifically for pulling or lifting loads to considerable heights. We are amongst the most reputed names in the industry, offering Diesel Pulling Winch. Banking on our enriched industry experience, we are able to supply Diesel Pulling Winch. We offer durable and sturdy diesel winches which are equipped with prime mover, gearing system, drum system and drive system. The prime movers can be electric motor or diesel engine as specified by clients. Our precisely designed diesel winches are used for lifting, pulling, hoisting and other movements.